The BLC partnered with Vega School in Cape Town and the Dutch university Fontys Academy for Creative Industries (Fontys ACI) in May to host a five-hour hackathon. The students were asked to develop a communication toolkit for facilitators and intermediaries to communicate various upgrading principles with township residents in the process of upgrading their neighbourhoods and houses. NGO’s working in the field of upgrading have already developed and applied a wide range of possibilities of upgrading, like re-blocking, using passive design principles in construction and facilitating incremental upgrading of homes. Despite the existence of a wide range of options for upgrading, research shows that NGO’s often struggle in communicating the possibilities to the end user. NGO’s have to work with residents with a wide range of backgrounds, literacy levels, roles and age. Communication appears to be the key to catalyse co creation for upgrading in the communities. 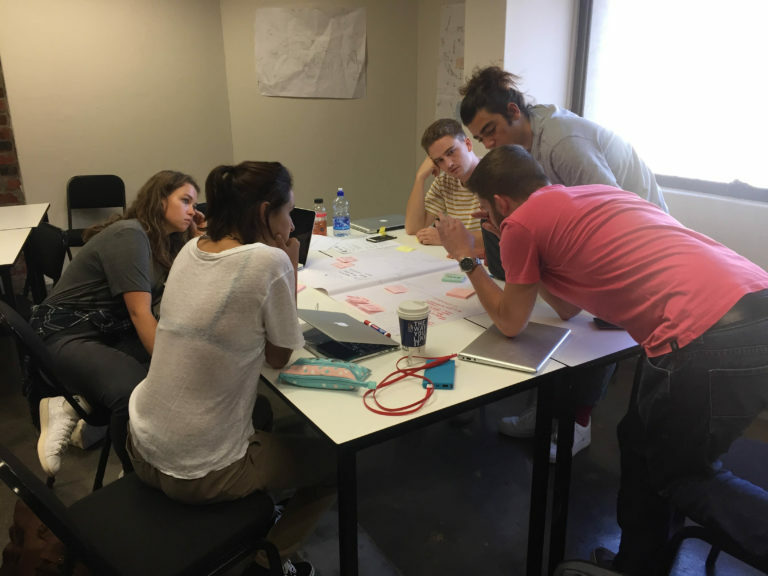 For the hackathon, five groups of South African, British and Dutch students at Vega School in Cape Town co-created in a virtual classroom with a group of Dutch students hosted at Fontys ACI in Tilburg, The Netherlands. The hackathon was subdivided in three stages based on the Design Thinking principles: students started empathising on the challenge and target group, then started ideating on concepts for toolkits and finished with rapid prototyping and a project implementation plan. The students received intensive support and feedback of from the BLC team and lecturers of Fontys ACI and Vega school. This resulted in a wide range of concept proposals for toolkits which forms a valuable input to the BLC project. This project was developed in a collaboration between the BLC team, Vega School and Fontys ACI in the Netherlands. Fontys ACI is currently developing its hotspot in Cape Town – the university strives to collaborate and co-create with various stakeholders grappling with real life challenges in South Africa.